McCormick Real Estate & Management introduces you to a unique investment opportunity – a combination of retail shops and apartments for sale. 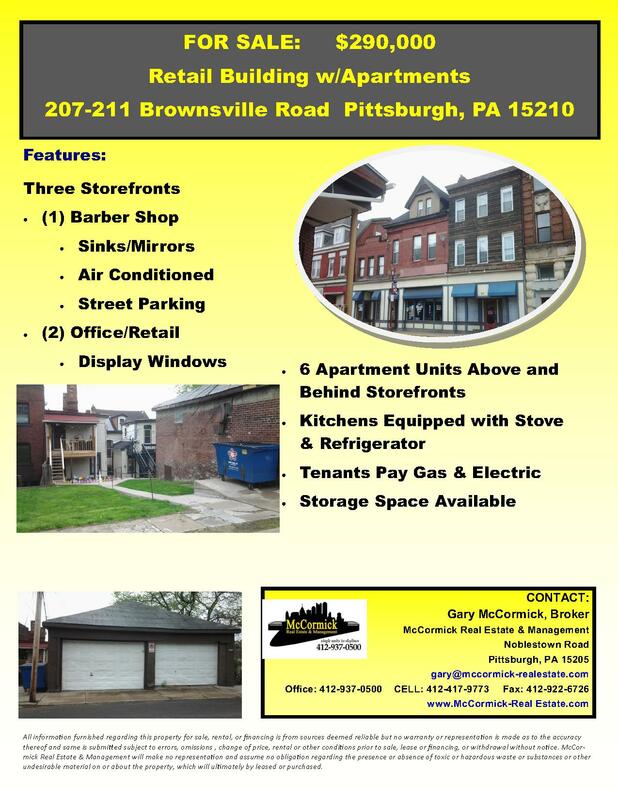 These 3 units located at 207, 209, and 211 Brownsville Road consist of three (3) storefront buildings with apartments above and behind the storefronts. Ideally located along Brownsville Road, these storefronts and apartment units are accessible to public and private transportation. One storefront is home to a barber shop, complete with sinks and mirrors. The other two storefronts may be used as office and/or retail. All three storefronts are air conditioned and have large display windows – enticing walkers by to stop in the retail/office establishments. Businesses are exposed to 1,000+ vehicles per day. Street parking is available to patrons. 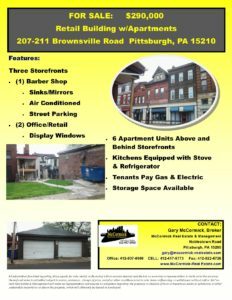 Above and behind the storefronts are apartment units, making this a great investment property for the first time or the long established investor. 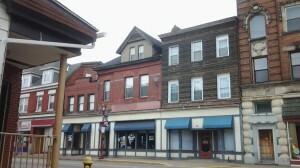 Storefront may be used for office or retail purposes. Amenities include air conditioning, large display window, one restroom, and storage space. Tenant is responsible for gas, electric, and trash removal. At the rear of the building (facing Locust Street) is a single two bedroom apartment with wall to wall carpeting and equipped with a refrigerator and stove, and a private entrance. Tenant is responsible for gas and electric. Storefront is home to a barber shop equipped with sinks and mirrors. Other amenities include air conditioning, large display window, and one restroom. Tenant is responsible for gas, electric, and trash removal. Located at the rear of the building facing Locust Street is a 2 story/2 unit apartment building. Located on the first floor with a private patio entrance is a three (3) bedroom apartment with wall to wall carpeting and equipped with stove and refrigerator. The second unit is a two bedroom apartment located on the second floor and is accessible through its own private entrance. This unit boasts of wall to wall carpeting and is equipped with a stove and refrigerator. Tenant is responsible for gas and electric. Storefront may be used for office or retail purposes. Amenities include two display windows, one restroom, and air conditioning. Tenant is responsible for gas, electric, and trash removal. At the rear of the building facing Locust Street is a three unit/two story apartment building. Located through the first floor private entrance are two – one (1) bedroom apartments with wall to wall carpeting and equipped with a stove and refrigerator. The second floor apartment is accessible through a private porch entrance. This apartment has wall to wall carpeting and is equipped with a refrigerator and stove. Tenant pays gas and electric. A large detached garage with double doors is also available. Within this garage unit is one bathroom and plenty of storage space. Tenant pays electric. Additional storage space exists beneath the garage behind separate doors. Street parking is available to all tenants.